Kris McCoy calls her startup Rustics At Ridge. 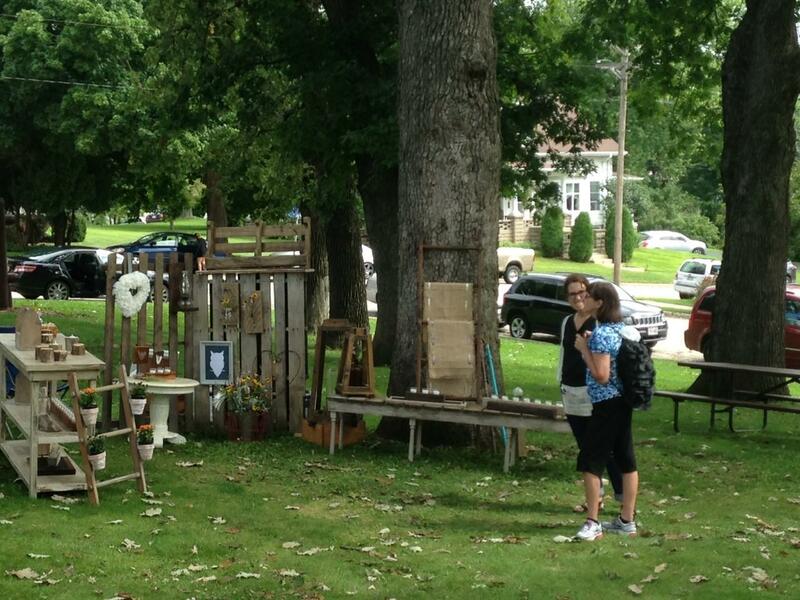 As Kris McCoy sets up at the Saturday Mineral Point Market in Water Tower Park, she is surrounded by her artfully arranged wooden creations – a large buffet, numerous candle holders, decorative ladders, to name a few. 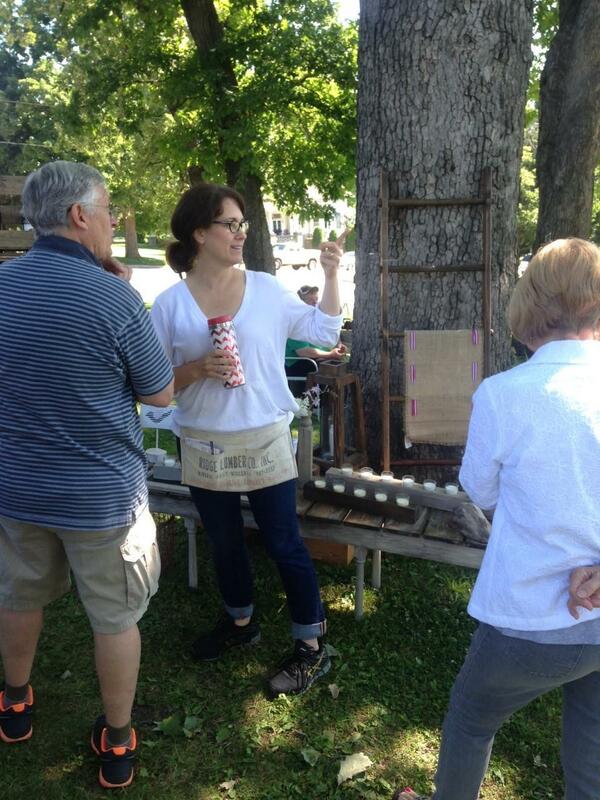 McCoy loves the people meeting part as much as she does creating her pieces. McCoy and her husband have lived here 23 years and raised their four children here. But McCoy’s root run deeper in this Iowa County community. “My family is originally from here, my parents retired back here, they actually grew up here, and my dad’s family has a farm that’s from the 1840s,” she says. Making stuff out of wood isn’t her profession. McCoy loves her job as the Mineral Point Middle School High School librarian, but said she wanted to try her hand at creating something. 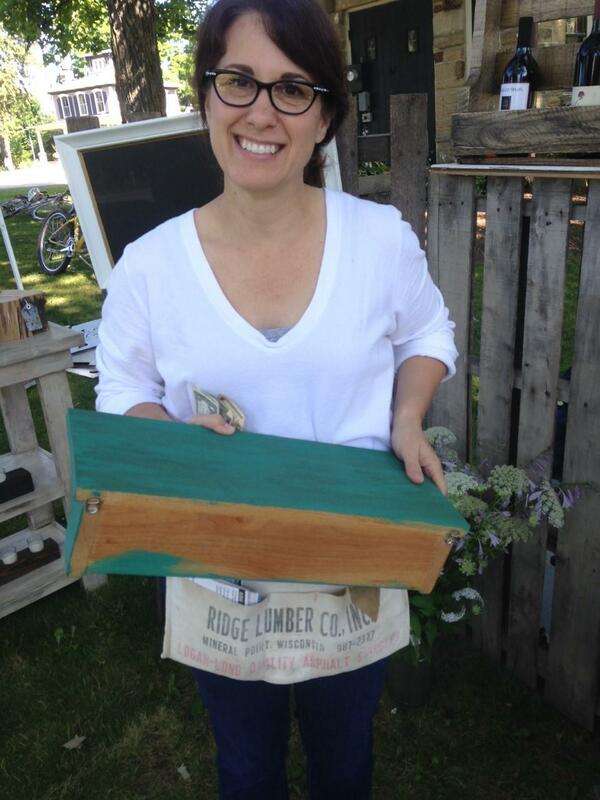 The inspiration came when McCoy spied a long piece of wood at her husband’s lumber business. 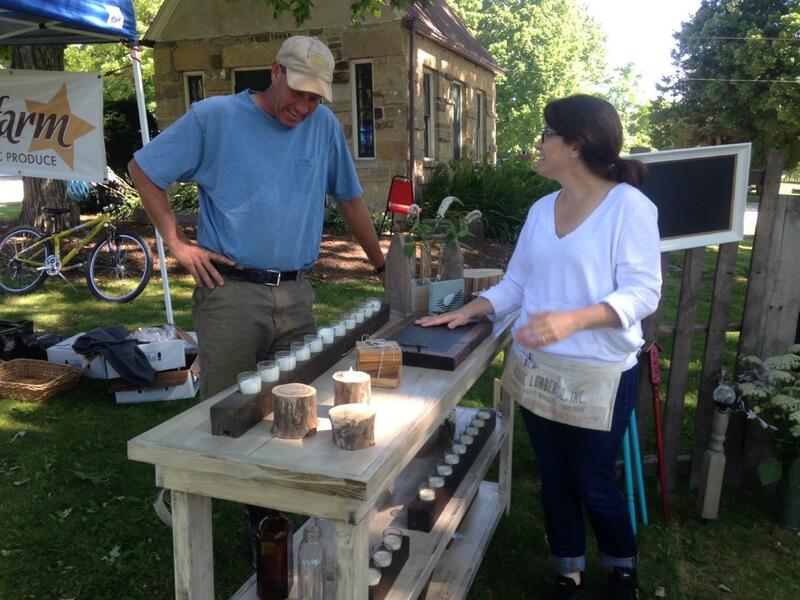 McCoy chats with Shooting Star Farm's Rink DaVee, one of the people who founded the Mineral Point Market in 1995. McCoy calls herself a major thrifter. “I love going to yard sales and thinking what can I do with this or that,” she says. Pointing to a shelf she salvaged,“I think it was somebody’s shop project, probably in middle school because it was oak,” McCoy says. She didn’t tamper with its original hooks – soda can pull tabs. “I just painted it up and did an antique wax and added (antique glass) insulators, kind of making it a unique piece. There’s not another one like it,” McCoy says. When McCoy's project inspiration requires heavy building or drilling, her husband steps in. "And then I do the finishing," she adds, "My husband is a carpenter by trade so for him to still be able to do this type of work is fun, and we love working together." Her husband has become more and more involved in McCoy's startup. "He can't recycle a bottle anymore. He says we should take the label off, there's something can build with it," she says. McCoy saved someone's shop project and gave it a new life. A number of people celebrated Earth Day over the weekend, perhaps renewing their commitment to eco-friendly habits. There's one practice that might not be on everyone's radar: finding new life for old textiles, from clothing to household décor. Bob Woycke recycles textiles for a living. "As a kid, I was living on 12th and Becher. I remember the ragman coming through with the horse and cart in the alley. Little did I know, I'd end up in that business," Woycke says. WasteCap Resource Solutions has been around for 15 years. Salvaged beams and art deco windows are just part of its vision to transform waste into resources. WasteCap leaves no brick unturned. 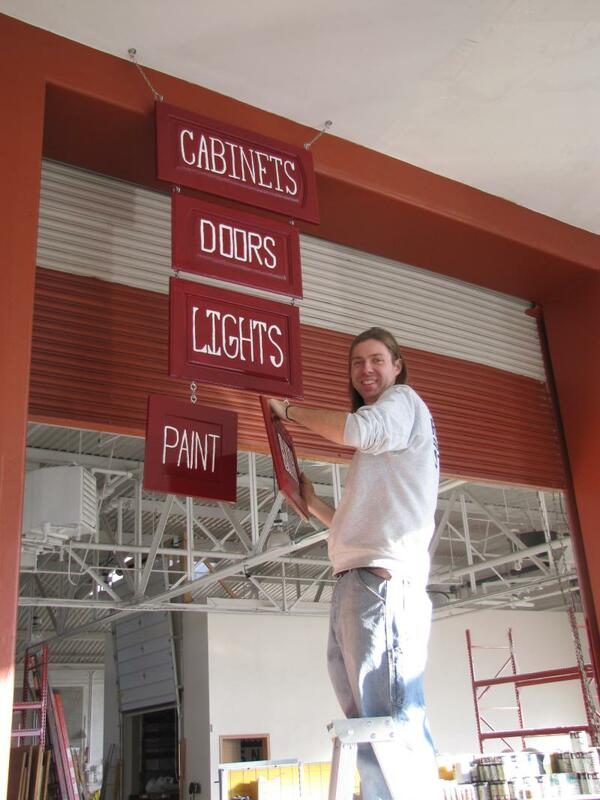 Project Manager Justin Dall’Osto knows the facts. “U.S. landfills are made up 41 percent of construction demolition materials. Wisconsin is around 30 to 31 percent. So we’re a little a less but we’re doing our part to try make it even lower,” he says. Recycling and repurposing materials can not only be a cost- savings in what is – for many people – tight financial times; it’s also becoming hip. Even Martha Stewart talks up repurposed furniture and décor. ReStore is one of the local operations riding on the trend. What might appear to be a discount hardware store, actually sells new and “gently-used” building materials, furniture and the like. The proceeds help fund local Habitat for Humanity affiliates build and renovate homes.